Think Skinny, Feel Fit Am I Overweight or Do I Just Think I’m Overweight? In this chapter, I want to discuss a delicate subject for many of us: our waist size. The subject of weight, as you know by this point, is very personal to me. I wasn’t born fat. As a boy, I was thin and spritely, but, little by little, I started gaining weight until I reached a critical point during my teenage years. I know what it’s like not just to be fat, but to feel like a fat person who will always be a fat person without any hope of ever going back. But what does it mean to be fat? For some, it’s when your clothes are tight or you can’t button your pants anymore. When you don’t go to the beach because you don’t want anyone to see you in your bathing suit. When you fall in love with an outfit at the store but they don’t carry it in your size. When you hide when someone wants to take your picture. For others, it’s when you can’t put your socks on. When it’s difficult to walk. When you can’t sleep because you have trouble breathing. When your profile picture is just your face because you’re ashamed of your body. When getting out of bed, or up from a chair, or climbing a set of stairs becomes a monumental task. We all have a definition. But the common factor is that when we’re overweight, we all feel different or uncomfortable. You may come to the conclusion that you are an overweight person, but that’s not true. Your body may currently be overweight, but that does not define who you are. It’s not something you need to learn to live with. It is a situation you can change. In my case, as with many people, I didn’t realize how much weight I’d gained until I was bordering on obese. And still, I continued to eat and put on more pounds. Sometimes, we don’t see the signs of weight gain—or we ignore them. Other times, we just don’t have a good measure of what it means to be at a healthy weight. I had no reference point for my ideal weight. I entered puberty in a family that skewed toward the heavy side, one that celebrated kids with big, chubby, pinchable cheeks as being healthy and beautiful. Both my parents are Venezuelan, but my father is the son of Syrians. So when they got married, my mother had to adapt to his Arab culture, much of which revolves around food. In that culture, a woman shows her husband how much she loves him by feeding him and cooking for him all the time. And my mother took to it right away. That meant that when I came home from school for lunch I sat down to an incredible feast. An average lunch in my house was Arab rice with noodles, tabouleh salad, hummus, pita bread, a plate of marinated olives and pickles, muchacho en salsa roast beef, with all the soda and sweetened fresh-squeezed juice you could drink (because sugary drinks taste better). And if that wasn’t enough, we never ended a meal before dessert and a plate of fruit. Yes, both! Aside from these daily feasts—which were, to us, simply regular meals—we celebrated every single event with huge spreads of food. From birthdays to graduations, from holidays to new births, each of these special celebrations involved a tableful of lavish dishes. The more food the hosts had to offer, the more it looked like they were taking good care of their family. The dinner table was a reflection of health and prosperity. The same thing went for the kids in the family. The chubbier and more rotund, the stronger and healthier it meant the child was—especially the boys. In my father’s family, each of the boys is named Alejandro, after my grandfather. And when they learned that my father was going to have his own Alejandro to add to the family it was cause for sheer jubilation. For the nine months my mother carried me, the party revolved around her pregnancy. So that’s how I came into the world—celebrated and constantly surrounded by these joyous feasts. The party carried on into my childhood. My paternal grandparents made me whatever I wanted to eat, whenever I wanted it. They lavished every delicacy on me. The chubbier I was, the healthier I was in their eyes. My grandmother loved to pinch my cheeks and tell me how strong and healthy I looked, how absolutely perfect I was. I was gaining way too much weight, but I only ever got positive reinforcement. Without realizing it, they were rewarding me for putting on pounds. What I learned is that this is what it meant to be healthy. Plus, seeing me like that made them happy. They viewed me as a strong, healthy boy who would one day grow into a big, manly man. And my father marveled at how well I ate. I’ll get further into that in a later chapter, when we discuss the role emotions play in all this, something I’d learn much later in life. Given my environment, surrounded by food and praise for being chubby, how was I to guess that my weight gain was anything but positive? Why would I think of myself as fat? When I finally did realize I was overweight, it took me a long time to accept it. The first time I felt like the fat kid was in the fifth grade. At that time, I had two groups of friends, the Venezuelan kids from school and the Arab kids from the social club where we spent our weekends. At first, when I was just a few pounds overweight, I was considered strong, healthy, and cool. My Arab friends praised me for how big and strong I was. They’d say things like, “You’re just like your grandfather,” and that made me feel proud and happy. But little by little, this started to change, especially at school. My weight went from being a secondary character to the starring role in my life. At recess when I’d play baseball with my classmates, it became harder and harder for me to run the bases. As I huffed and puffed, only to be thrown out, I’d hear the others make fun of me. “You got thrown out for being a fat piece of sh—!” Others called me “Cheesy Arepa” or “Shamu” or “Fatty.” That’s when I started to realize that I was overweight. How could I not? They reminded me of it daily. It only got worse as I got older. At first, I couldn’t understand why they were making fun of me. I stated to think, What’s wrong with them? Could it be I’m really that slow and fat? I had never seen myself that way. Those first taunts—the first of many in the years to come—opened my eyes and made me understand that my weight wasn’t normal, that I was different, that I really was heavier than all the other kids: I really was overweight. It was like flicking on a light in a dark room for the first time. My perspective changed completely. From that moment on, whenever I got dressed to go to school, I was much more aware that my body wasn’t like everyone else’s. I felt ugly, uncomfortable. I hated seeing myself and realizing I was different because I was fat and they weren’t. When I buttoned my pants, I realized the waist was buried beneath something extra, that there was a part of my body that bulged over the top—a great, big belly that had never been so obvious. The elastic waistband or the button left an imprint on my skin. Until that point, I had been used to my clothes always being tight. I’d gotten used to sucking in my gut just to button my pants. I didn’t remember what it was like to put on a pair of pants that fit. This moment of realization filled me with sadness and anger. However, I still didn’t quite understand what was happening to me, nor all that lay ahead. At that point, I was about 40 pounds overweight. I hadn’t yet become morbidly obese, ballooning to a weight of 314 pounds. I quickly went from being the happy, chubby cool kid, a boy who was always smiling, to feeling different and unhappy. I now saw everything in my life through the lens of this excess burden. Being overweight is like carrying around excess baggage twenty-four hours a day, seven days a week. It’s like going on an overnight vacation and bringing enough luggage for an entire year. You put on your traveling clothes and shoes, grab your wallet, and then you pack a second pair of shoes and flip-flops in case it’s warm. Later, you pack another bag with more clothes because you don’t know what to bring, so you pack three T-shirts instead of one, four dresses instead of two, and you keep going until nothing else fits. And then you pack a third bag. You do all of this without even thinking, without realizing you’re now going to have to carry all this on your trip. By the time you finally leave the house, you’re carrying so many bags that you no longer walk the same. You can barely carry on a conversation because you’re huffing and puffing. You can’t enjoy the trip or your travel companions because your sole focus is maintaining your balance as you lug around all this extra weight. Soon, you’re carrying around so much stuff that people don’t even notice the actual you beneath all your baggage. Your eyes, your body, your smile, your personality (yes, even your sexuality), your very essence is buried under all that baggage. It can be isolating, yet it also becomes your refuge. You draw all kinds of attention as you walk by because what do people see but someone waddling along carrying eight bags of luggage? People start to view you as careless and messy. Soon, they begin avoiding you. Now, picture carrying all of that and trying to sit in the middle seat of an airplane or squeezing into a tiny elevator or getting onto a ride at a theme park or simply trying to go out to dinner. It’s a constant burden that follows you wherever you go. Think about all those examples. Wouldn’t you turn around to get a look at this person who is carrying around so much weight he can’t even walk straight? Maybe you’d avoid looking at him instead because it bothers you to see him or because you don’t know what you can do to help. Or maybe you just silently judge him and think he must be messy and careless. No one can help you with all this excess baggage when you’re carrying around an entire closet. The truth is you’re the only one who can help yourself. But it’s hard to take that fundamental first step. And with each passing day that you ignore the problem, you bury yourself deeper and deeper beneath this extraordinary weight—a burden that is not only physical but emotional as well. Over time, you simply come to accept this new way of life to the point where your very essence crumbles and this facade, this baggage you’re carrying around, becomes your projection to the rest of the world. Too often, the weight is crushing, but you don’t realize it. You can’t see yourself from the outside, from behind, from above . . . because you can barely move. And don’t even get me started on how it affects your health. Imagine the effort it takes to move around, the toll it takes on your legs, your arms, your back, your neck, your internal organs, none of which are meant to carry around that much weight. Every morning, you have to get out of bed with all that baggage on top of you, and you no longer feel as agile as you once did. When you go out, to school, to work, to the grocery store, you lumber along much more slowly. Every breath takes effort. Your knees and feet hurt. Your back is killing you. The only thing you want to do is lie on the couch to give your body a break—a body that is screaming out for help while you ignore the signs. Your body just can’t handle all the extra bags you keep adding to your load every day. Over time, that pain and exhaustion depress you more and more, sinking you deeper into isolation. You begin to drown in sadness and loneliness, and, defeated, you run to the only thing that soothes you, the only thing that won’t scold you or make fun of you, your only consolation: food. I know this feeling all too well. When I realized I’d become morbidly obese, it felt like there was no turning back. I had no idea how I was going to take all this weight off. I didn’t know where to start. Little did I know at the time, I was going to have to address not just the physical baggage but the emotional baggage that started piling on when I was a chubby little boy. I want to make it clear again that this is no ordinary diet book. I’m not going to give you recipes to help you slim down physically; the advice in this book is about losing the weight that is burdening your soul. To be healthy, you not only have to look good. You have to feel good. That’s the goal in this chapter. I want you to embrace your past, enjoy the present, and let it fill you with anticipation and possibilities for the future. That said, if you’re overweight, then having a balanced diet, taking supplements, and establishing a good fitness routine are fundamental to lose weight and maintain a healthy lifestyle. When I finally opened my eyes and realized I was overweight, I tried all kinds of methods to lose the weight. I ate more, I ate less, I stopped eating altogether, but nothing worked. I did all kinds of crazy diets, even the so-called pineapple diet, where I ate a sensible lunch and only pineapple for the rest of the day. But to me that meant I could eat anything with pineapple in it. I would gorge on pineapple cake. If I had come across chocolate-covered pineapple, I’d have inhaled an entire bar of it. That’s how my logic worked. When I was growing up in Maturín, Venezuela, men didn’t go on diets. Diets were for girls. That’s why I tried to diet on my own, in secret, reading magazines or eavesdropping on the women in the family. At one holiday get-together, I overheard my female cousin say that drinking boiling water helped her burn fat and shrink her stomach. I shudder to think about it today. Insanity! But back then, I was so desperate, I was willing to try anything, including drinking boiling-hot water. In truth, she did look thinner, and that only egged me on. The next morning before I left for school, I hurried downstairs while the rest of the house was still asleep and boiled a pot of water. When it started bubbling, I served myself a glass, took a deep breath, and drank. The pain was so intense I never managed to finish the whole cup, but I drank as much as I could, figuring that the more it hurt, the better it would be at helping me lose weight. When I stepped on the scale on the third day and didn’t see a difference, I got frustrated and cast the boiling water regime aside, looking for another magical solution. I would try anything, no matter how dangerous or ridiculous. I went from pineapples to boiling water to the shakes that were all the rage at the time, but I saw no difference at all in my weight. So what did I do? I threw in the towel, figuring there was no hope for me, and I started to eat again. I was depressed and I thought of myself as a hopeless case: I’m not good at diets. There’s no hope for me. It’s all in my genes. It’s my body. I’m fat and that’s all there is to it. My real issue was that I was buying into quick, magical solutions, which of course do not exist. I was severely misinformed, I had no idea what a balanced, healthy diet was, and I did not have anyone to guide me. Yet I thought I was doing all the right things. I had even added regular exercise into my life, something that wasn’t easy since I was never much into sports or physical fitness. I signed up at a gym and went every day. I started exercising to lose weight; not to achieve a healthy body. All I did were aerobic exercises, but I avoided weights like the plague. I’d heard (incorrectly) that lifting weights would make my body fat harden, and then I would never lose weight. How wrong I was! Weight training isn’t the enemy. It doesn’t harden fat, but instead tones muscle and helps burn calories. But I didn’t know that back then. I spent years trying different diets, experiencing that frustration at not seeing results, taking note of what worked and what didn’t, and trying to understand what made me gain or lose weight. I was tired of eating insipid food that didn’t resemble my beloved Latin food. Armed with that information, I started devising a plan that encompassed everything—nutrition, movement, supplements, and emotional health: Yes You Can! (www.YesYouCan.com). I recommend you consult a professional to create a balanced diet and a sustainable exercise plan that will give you results you can see in a mirror (that wicked mirror that can torment us when we’re overweight). It’s time to turn the mirror into your friend. It’s up to you to take that first step. I want to clear up another thing. There are many types of obesity, such as the kind linked to a disease (such as hyperthyroidism), weight gain due to certain medication, or having a naturally slower metabolism. But in most cases, our excess weight gain is directly tied to our emotions. Many of us turn to food to cover up our emotions. We eat to fill a void, to forget emotional traumas, or to pacify emotional pain we don’t want to endure. But we don’t realize that food isn’t a cure-all. Yes, it may help you forget your problems momentarily, but that pain, that emptiness, remains. The pleasure you get from food is fleeting; a chocolate bar can’t cure your feelings. You can gorge on every delicacy in the world or try every diet known to man, but if you aren’t truly honest with yourself, if you don’t get to the root of the problem, you’ll never achieve the happiness you deserve. I speak from experience. It wasn’t until I finally learned to see my emotional weight and its causes that I was able to begin to pursue my dreams. CAN YOU BE A HAPPY CHUBBY PERSON? This is a very personal question. I don’t know what your experience has been, what you’ve seen, felt, and suffered throughout your life. I think it’s a question each person has to ask him- or herself. So I invite you to ask yourself that question: Is the chubby person inside of you happy? Before you answer, I want you to reflect on your feelings, on your emotions, your heart, your soul, because I want you to answer honestly. From personal experience, based on my own life and the anecdotes from the thousands of people who have come to Yes You Can! hoping to lose weight, the answer is no, there’s no such thing as the happy chubby person. Why do I say that? Because I have lived this and felt it deep in my flesh and bones, and I can say with honesty that I wasn’t happy. Every now and then, I might have felt happy, but I wasn’t truly happy. That image of the happy-go-lucky chubby person is, to me, a mask we put on to cover up our true feelings. It’s an excuse we use to avoid confronting the real problem. It’s a crutch we rely on to cover up the pain of things like divorce or abuse or loneliness. We act like the happy chubby person to cover up the pain in our hearts and souls. Nevertheless, when I asked this question on my Facebook page, though many people agreed with me, there were various others who didn’t. Many responded that there is such a thing as the happy chubby person. Various men and women defended their point that being chubby didn’t affect their level of happiness. And that’s a valid feeling because, as I said at the beginning, this is a very personal question intimately tied to our experiences, culture, environment, family, and friends. But what no one can overlook is the topic of physical health. Regardless of how happy you feel, if you’re overweight, your body is straining. That’s a fact. A person who is overweight is much more susceptible to illness, and many are already dealing with that fact. And when you have an illness, you can’t have true happiness. When your body is overweight, it’s a struggle for your arteries, heart, knees, and lungs. Your body is at a disadvantage. It’s not functioning the way it should. It’s not in balance, and that condition can’t be synonymous with happiness. I don’t think the case for physical fitness is debatable, but we have to respect every individual’s feelings. 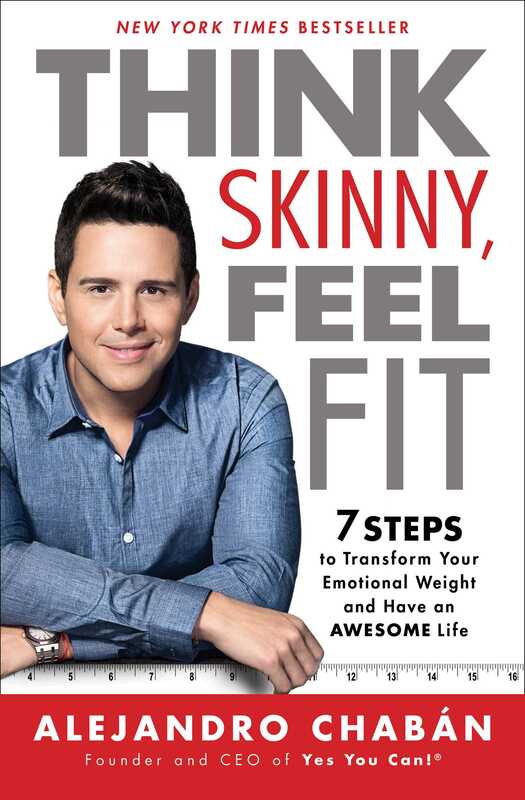 Much the same way, we could ask whether you can really be a happy skinny person. The majority might say yes, but certainly not everyone who is skinny is happy. In fact, happiness doesn’t have an ideal weight. Happiness can’t depend on a scale. It can’t be based on a number. It’s not about pounds or inches or waist size. Happiness comes from within. We’re happy when we figure out our purpose in life, when we’re healthy in mind, body, and spirit. When we can face down the pain in our life and finally break free from it. That’s why I want to help you heal your soul, not just your body, so you can discover true happiness. You have no idea how wonderful you’ll feel when you understand, accept, and achieve emotional well-being. My hope for you is that you’ll discover the true nature of your pain, sadness, and frustration so you can replace them with light, peace, and joy. In this way, you will finally make peace with your past, forgive yourself, accept yourself, and love yourself so you can chase the future that you want. But first, we need to understand what emotions are, what role they play in our lives, and how they affect our daily life. In the next chapter, let’s explore our feelings together so we can begin to understand what’s happening with the overweight person inside of us. I want you to stop living in the past, to free yourself from your pain, whatever it is that you are punishing yourself for. I want you to open your eyes and take responsibility for what it is you’re feeling right now, and, once and for all, get rid of all the excess baggage that’s weighing down your body, mind, and soul.